Call The Doctor is working hard behind the scenes to secure some funding, please get behind this service and phone on 1800 22 55 84 if you need a doctor in the after hours period when your regular GP is closed. Current access to after hours care is poor and the demand is particularly high in Tasmania and South Australia because many GPs are unable to see their patient the day they ring up, being booked for up to a week in advance. 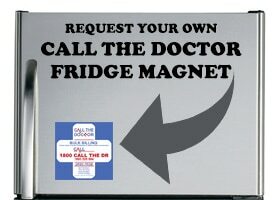 There are no other after hours services after 10 pm that are as well staffed as Call The Doctor to tackle the demand. This leaves patients who are acutely ill unable to see a doctor when they need it. Call The Doctor see patients who otherwise wouldn’t get to be seen until days later, therefore we can prevent the progression of illness. 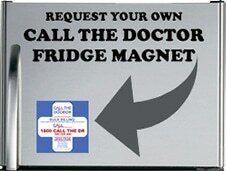 Call The Doctor is your local after hours medical service providing home visits for patients. We are a locally owned and operated service focusing on primary patient care through the ethos “prevention is better than cure”. We are helping reduce the burden on hospitals, paramedics other service providers in the local community. The Call The Doctor team has experienced the need for increased after hours service provision first hand. In the last 12 months we have attended several community events. We take these opportunities to speak directly with local people and hear their personal health care stories which only serves to highlight the after hours health inadequacies of our region. Feedback from families informs the Call the Doctor team that they are making a difference.